A long relationship between Jim Henson’s company and the Smithsonian Institution began in 1975 with the installation of Ernie and Bert puppets from Sesame Street in what was then called The Museum of History and Technology (now The National Museum of American History). For the country’s bicentennial commemoration, the museum mounted an ambitious exhibit called “We The People” celebrating all aspects of American culture and for the first time, really highlighting our shared popular culture. Being from Washington, Jim knew the Smithsonian well and was appreciative of the prestige that was implied by having one’s work displayed there. It was an honor to be included and, as it turned out, a good choice by the curators. 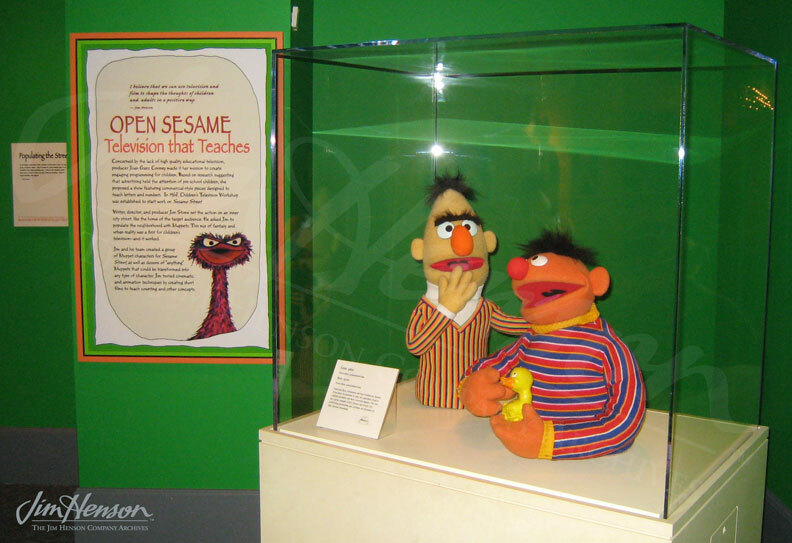 When the loan agreement expired in 1980, the museum asked for an extension, saying that “…the Muppets are the most popular objects in the ‘We The People’ exhibit.” Ernie and Bert remained on view at the museum for at least another decade. Along with collaborating with the Smithsonian Institution Traveling Exhibition Services (SITES) to bring the “Jim Henson’s Fantastic World” exhibit to audiences around the country, the Henson family continues their strong relationship with The National Museum of American History. In a ceremony in 2010, Jane Henson brought Jim’s original 1955 Kermit puppet and his co-stars from the local show Sam and Friends back home to Washington and donated them to the museum. Crowds gather every day to see them and the later Kermit on the third floor of the museum where they are displayed with other icons of pop culture like Dorothy’s ruby slippers, Fonzie’s jacket and Michael Jackson’s hat. For more information about the popular culture displays at The National Museum of American History, click here. 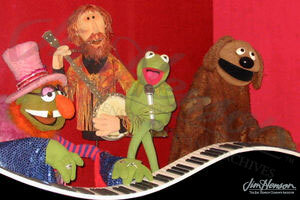 For more information about the “Jim Henson’s Fantastic World” exhibit, click here. 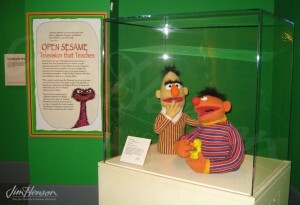 Ernie and Bert in the Jim Henson’s Fantastic World exhibit, 2009. Kermit in a special exhibit with Dr. Teeth, Jim and Rowlf at the Smithsonian, 2006. This entry was posted in 05-May '75, 1975, Appearances, Exhibits and tagged Bert, Dorothy, Ernie, Fonzie, Jim Henson's Fantastic World, Kennedy Center, Kermit, Michael Jackson, Smithsonian Museum, The Museum of History and Technology, The National Museum of American History, washington DC, We the People, World Puppetry Festival. Bookmark the permalink.